What is LCM of 12, 15 & 18? 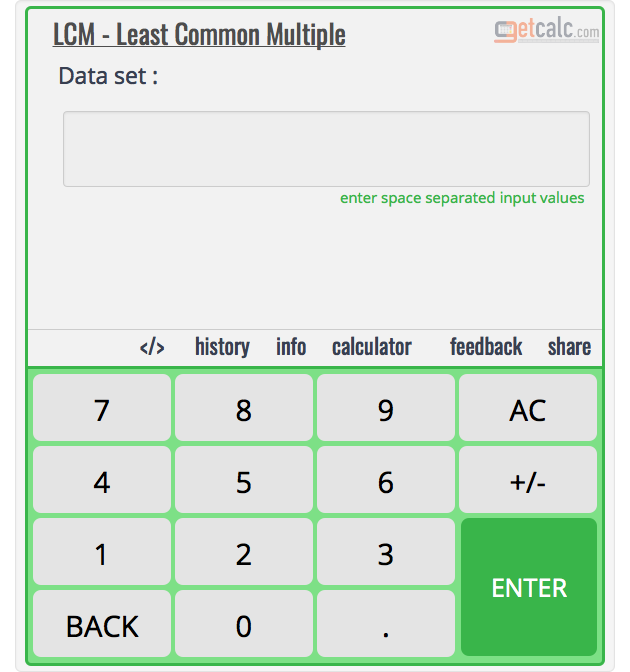 getcalc.com's LCM calculator & work with steps follows a special method to find what is Least Common Multiple for group of whole numbers or non-negative integers 12, 15 and 18. The least common multiple 180 is a product of common & odd prime factors between the integers which is divisible by each one an integer of this same group. The step by step work for LCM of 12, 15 and 18 may useful to understand how to find LCM for two or three numbers. How to find LCM(12, 15, 18)? Follow the below steps to find the least common multiple of given group of integers or whole numbers 12, 15 and 18 by using the most efficient and easiest method. lcm (12, 15, 18) = ? step 3 Choose the divisor which divides each or most of the integers of in the group (12, 15 and 18), divide each integers separately and write down the quotient in the next line right under the respective integers. Bring down the integer to the next line if the integer is not divisible by the divisor. Repeat the same process until all the integers are brought to 1.
what is the lcm for 12, 30 and 50? what is the lcm for 15, 18 and 81? what is the lcm for 48, 64 and 100? what is the lcm for 8, 10 and 12? what is the lcm for 9, 12 and 18? what is the lcm for 10, 12 and 15?